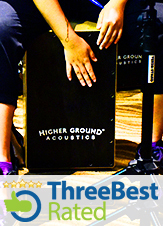 Level II will empower you to connect with your Cajon for greater expression. Through in-class supervision and group synergistic exercises, you will move from merely beating the Cajon to developing sensitivity during the highs and lows of song dynamics. You will also harness a good feel for various intensities of music and approach each song with detailed planning to create good rhythm balance for various songs.